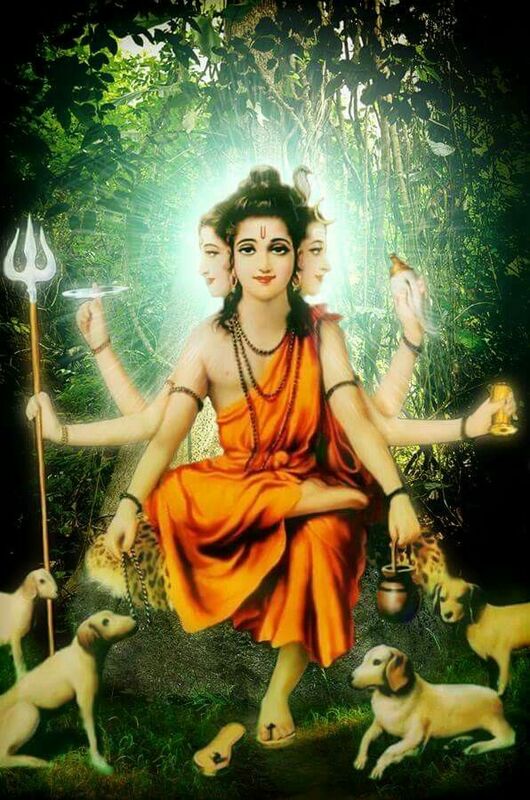 “The Avadhuta is so called because he is the immutable akshara; he is the most worthy of worship (varenya), he has shaked off all wordly bondages (dhuta-samsara-bandhana); and he is the implied meaning of tatwamasi, hence tattvamasyadi laksya. He who is always poised in his own Self after having crossed the stages in life and society [ashramas] and gone beyond all varnas and distinctions, such a Yogin is an avadhuta. His joy (priya) is to be envisaged as the head; delight (moda) the right wing [as in the case of a bird]; great ecstatic delight promoda his left-wing and ananda his very Self, thus he attain a fourfold condition like the four feet of a cow. Not by works, not by progeny, not by wealth, but by renunciation alone has he attained immortality. The Avadhuta’s unfettered existence in the world consists in his moving about freely (independently), either clad or unclad. For him there is nothing righteous or unrighteous; nothing holy or unholy. Through sangrahanyesti of his divine wisdom, he performs the inner ashwamedha yagya inside his consciousness. That is the greatest yoga. His strange and wonderful actions are total and completely in tune with his realization. One should not criticize or condemn him for his free and unrestrained behaviour. That is the great vow – mahavrata! His is never tainted by any actions like the deluded folks. Just as waters flow from all sides into the ocean which is full, and steady even so he alone attains peace, into whom all desires enter and dissolve without affecting him, not one who runs after objects of desire. Such is an Avadhuta! For there is neither dissolution, nor origination, there is none bound, nor anyone who aspires for realization, there is no seeker after liberation, nor anyone liberated. This indeed is the Ultimate Truth [from the Avadhuta‘s perspective]. By what desires should I go through samsara who is filled with the bliss of Self – paramananda-purna? Let those who desire for other worlds, perform their rituals. What ritual shall I perform? By what means and why – I, who am the Self of all that exists – sarvalokatmakah. Let others who think themselves qualified speak of scriptures and Vedas, as for me there is no such qualification, nor desire, for I am gifted with actionlessness. Let onlookers imagine whatever they want about my state. What does others’ imagination matter to me? I do not partake of worldly imaginations superimposed by others. This is the state of one who is an Avadhuta!